Guess I’m a bear now. Mixer has a limited vocabulary. 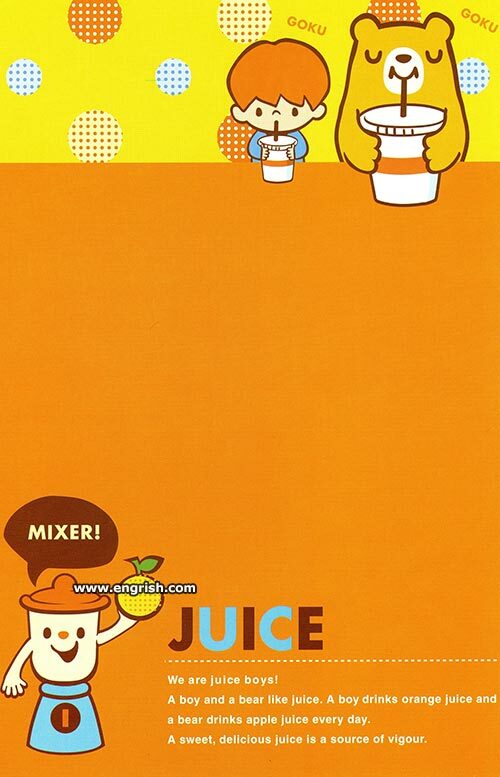 Me: hey mixer, what’s the best juice? You are fruit boys, huh? I can’t decide which one is more vigorous: Coron or Mixer? A sour, fermented juice is a source of vinegar. Does a bear juice in the woods? Wanna know what a girl drinks? Buy the R-rated stationery! I could bearly move after a juice that size. Who is King of the Juice? MIXER! and I thought only girls like juice…. this boy is gay! Two glasses a day kept her slender. First time I’ve ever seen a blender wearing a condom instead of a lid! Mixer + coron = moron? @Filboid | 2:16 pm: Well, he’s not Juicish. FYI “goku, goku” is the Japanese equivalent to English “glug, glug” for the sound you make when drinking a liquid. That blender….Is that a turn-able knob on his torso, is he wearing a Super-Blender T-shirt with a giant letter “I” on it, or is he just happy to see us??? The Pope uis actually, the Mixmaster.